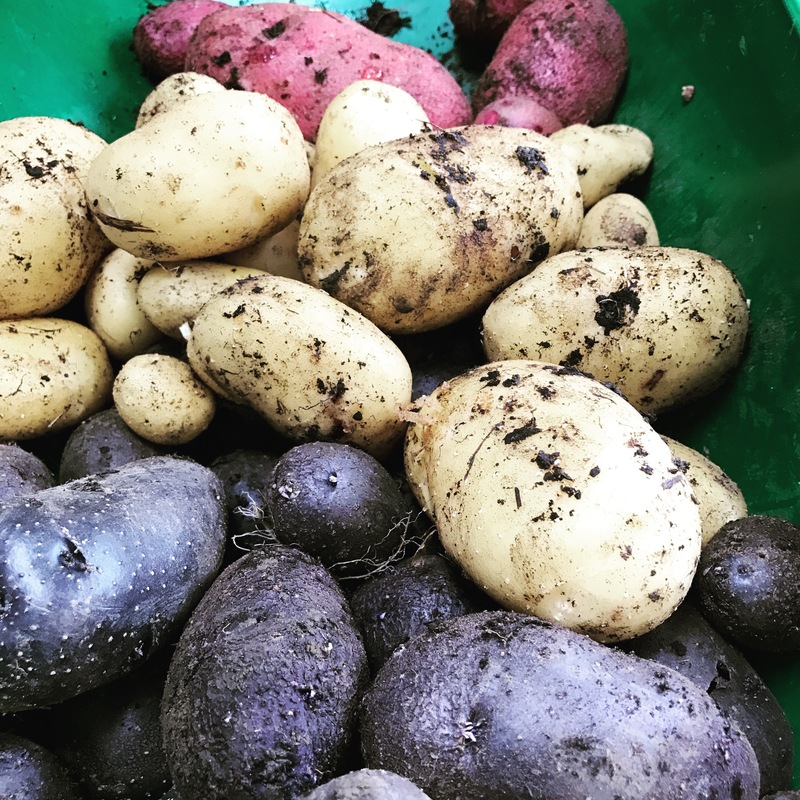 So all of our Spring planted potatoes have now been harvested and we have sampled some of each variety so I thought it would be a good time to look back at the varieties we grew and see which ones we would grow again and which ones we wouldn’t. As a reminder for everyone our six varieties were: Red Duke of York, Charlotte, Maris Peer, Maris Piper, Purple Majesty and King Edward. 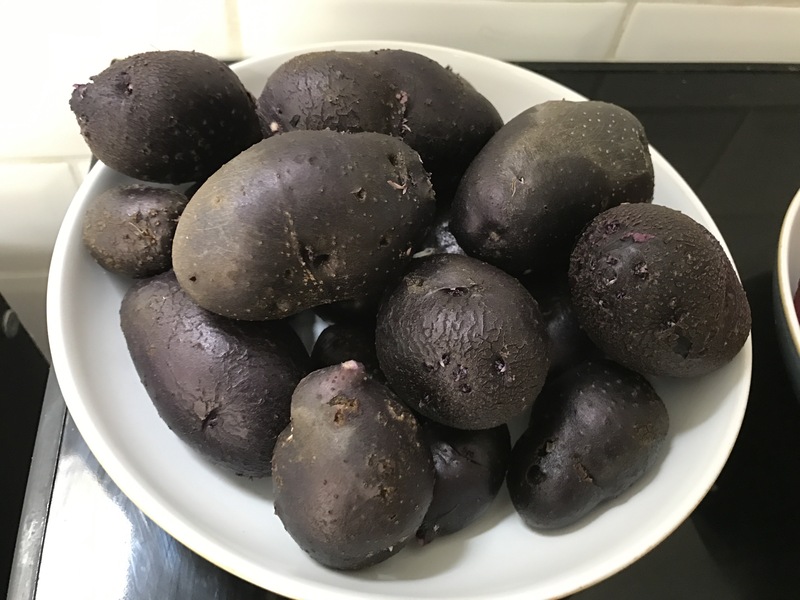 The Purple Majesty were an individual pack of seed potatoes and the other five varieties were all together as a beginners potato growing pack. 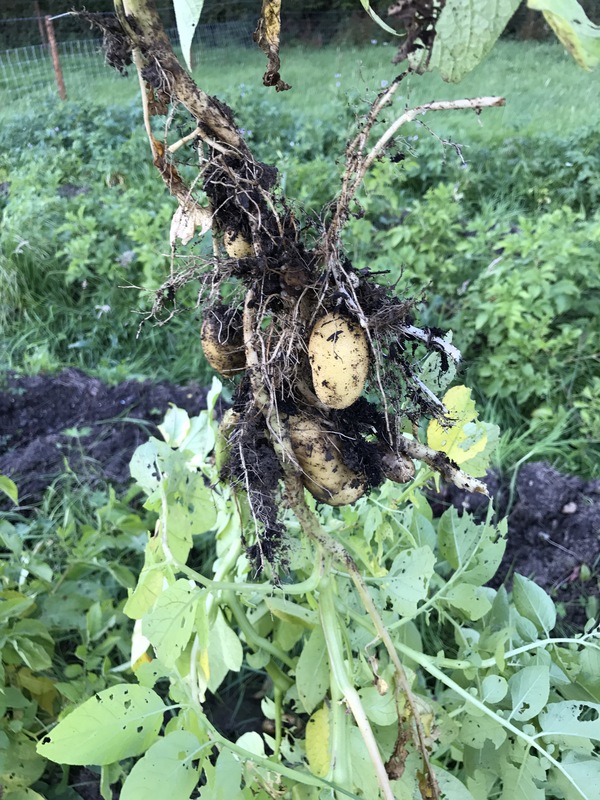 They were all planted in lazy beds in the field and ended up all being planted at the same time but were harvested at slightly different stages. Let’s look at each one in turn. These were my favourites I think. Our only first earlies they went in a little late and we left them in for about 11 or 12 weeks in the end and they were amazing. This variety produces red skinned potatoes that actually grew to an incredible size. We found they made great baked potatoes and also did well as roasties or mash. In fact there wasn’t anything we did with them that we didn’t enjoy. They also seemed to have been one of the varieties which were less damaged by slugs or other pests. These are a definite must for next year. 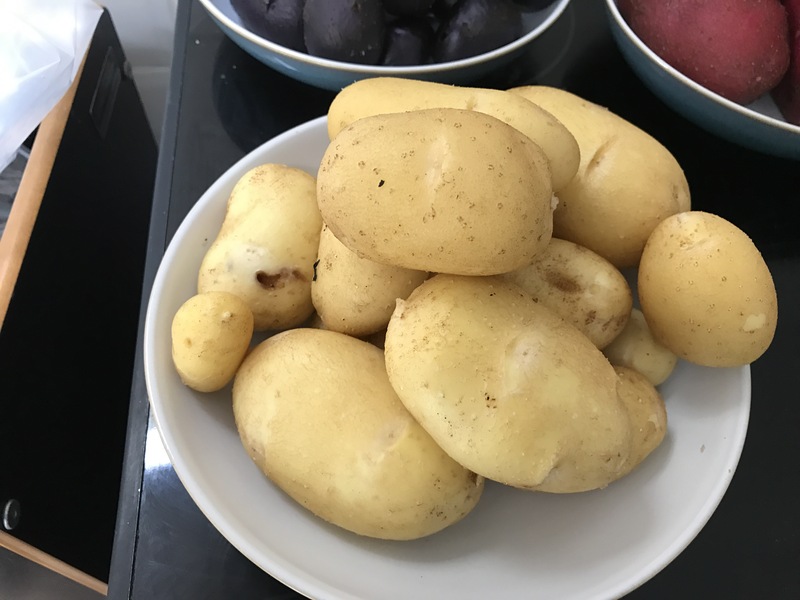 These are second earlies and a very well known supermarket variety of new potatoes. These turned out pretty well as well, a good job as we have these as our Autumn planted (or Christmas) potatoes. They were a good size for Charlotte’s and had beautiful yellow flesh. There was some damage by pests but not too much thankfully. I think we will probably do these next summer as well. Now these were one of our least successful varieties. Lots were attacked by slugs and we lost a significant amount of our crop to them. They have a more white flesh and just in general didn’t look as appetising as the others. The taste was okay but nothing special. These are not going to be repeated next year. Again this is a well known variety so I was expecting great things. This was another crop which was hit pretty bad by the slugs and other pests. The taste wasn’t bad, but nothing special and a bit disappointing for such a well known variety. I think we probably won’t be doing these again next year and will try something different. Now J had really wanted to grow these as he had once had them served boiled at a posh restaurant and wanted repeat the experience at home. They turned out very well and gave us a good yield. However, some people were a bit put off by the colour. C wouldn’t try them and we served them a couple of times for Sunday Roast (in combination with other varieties) when we had guests over and a couple of people weren’t keen on sampling them. They were also remarkably difficult when it came to spotting any defects until they were peeled so they weren’t going to be great to store. So probably not a one for next year. Again another well known potato variety and what should have been a reliable maincrop potato. 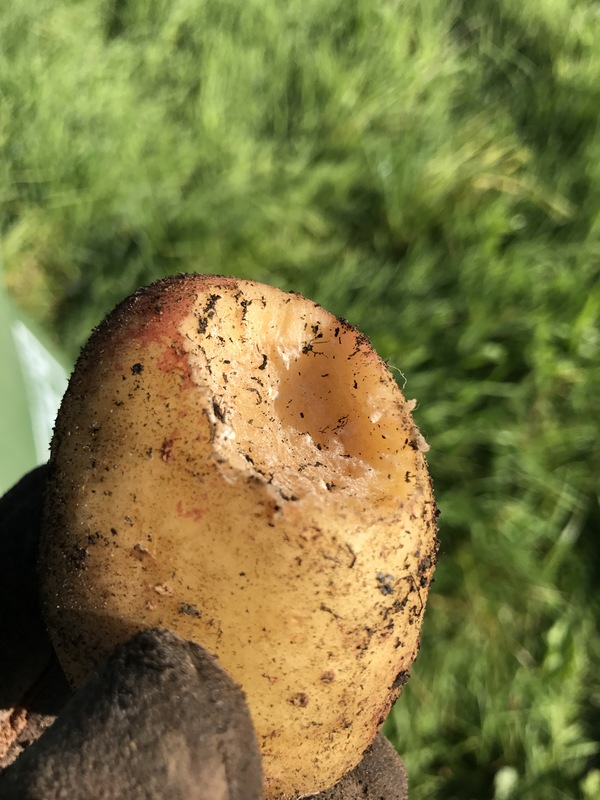 However, we had quite low yields (although this may have been that they needed earthing up more) and they ended up being nibbled on by some kind of rodent (my money is on a vole). And actually taste-wise they weren’t as good as other varieties, we were very disappointed in the roasties we made with them. So probably not ones to repeat next year. So we would grow the Charlottes, the Red Duke of York and would recommend the Purple Majesty but probably won’t grow ourselves next year. The Maris Peer, Maris Piper and King Edwards don’t have a place in our growing schedule for next year. 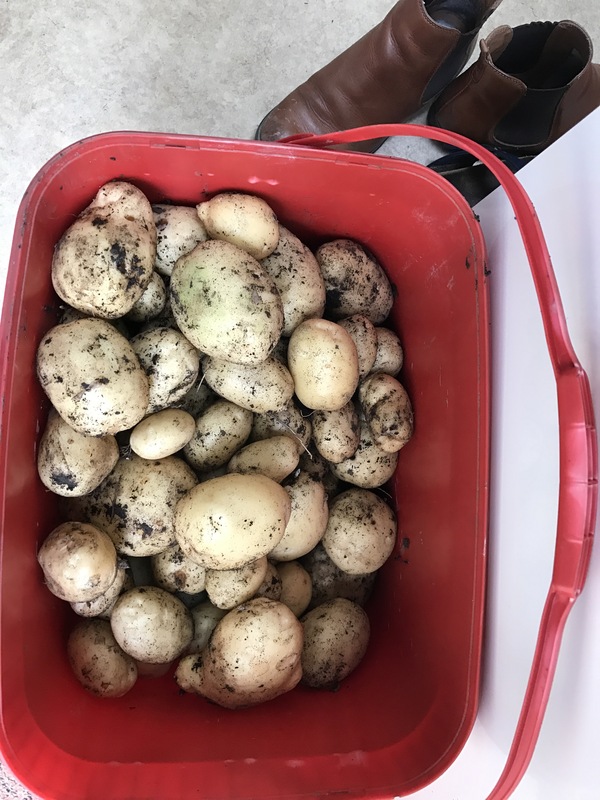 Some interesting points to note here are that apparently it is a bad year in general for potatoes (according to smallholders we know) so we might have had less slug damage and better yields if the weather had been different. And we probably should have earthed up a bit more but actually the lazy beds weren’t as easy to keep weed free as we might have hoped. Next job on the agenda – work out what different varieties to try next year! Any recommendations? Now I know by looking at potatoes there are different types but I’ve never looked into names. Quite interesting! There are so many different types available, not sure how different they all taste though! Oh I love the idea of growing your own potatoes! 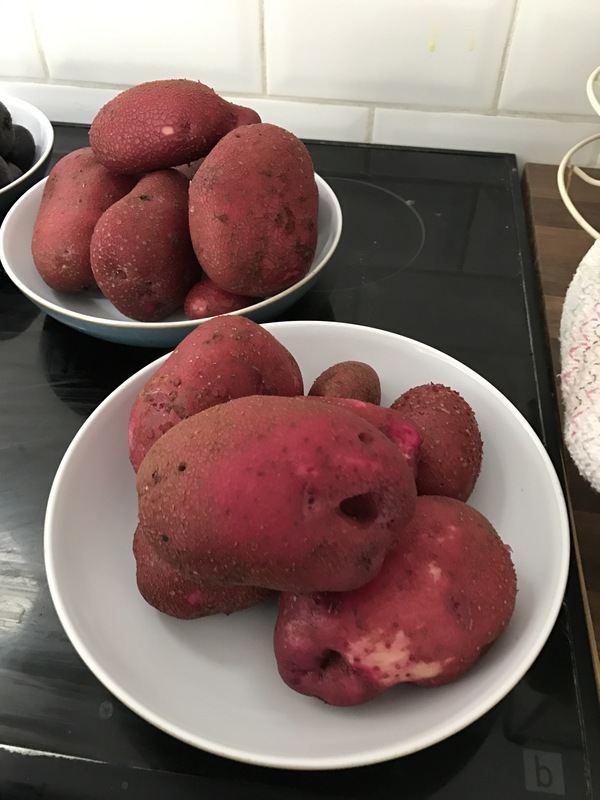 Both Tom and I pretty much live off of baked potatoes – will definitely have to put the red duke of york and charlotte on our list on ones to try and grow ! Our Maris Pipers were pretty poor but they did used to be my favourites too. I knew of a few different types but some of these are new to me! You’ve grown so many lovely potatoes! I was the same before I started growing, didn’t know there were so many varieties available. You had such a great haul! Can’t wait to hear what you’re going to try next year. I’m already browsing seed catalogues to plan next year. Wow what a lovely range of potatoes to enjoy, I have never tried purple potatoes before, do they taste any different??? They don’t really taste much different to normal potatoes quite a creamy taste, think the colour puts lots of people off though! I was aware of only two types of potatoes before. You introduced me to a whole new world… lol.. Those purple majestic potatos are very unique. Never heard of them before. Yeah it’s amazing how many different types there are.